Currently operating over 15 mines the Thiess group is one of the largest coal miners in the Australasian region. So when it comes to operating efficiencies Thiess is an innovative market leader, continually fine tuning their operations to maximise productivity. Recently Thiess’ Mount Owen open-cut coalmine commissioned Starline Motor Bodies to build a new concept service vehicle to enable their engineers to perform on-site service work on their fleet of mining equipment. But when an error in the generator set specifications was detected during the vehicle’s assembly Thiess needed the assistance of a supplier who’d think outside the box to get the project back on track – so they turned to Energy Power Systems Australia’s (EPSA) Electric Power division, which is also responsible for sales and marketing of the Olympian Generators product range. EPSA’s Electric Power division has established a reputation for solving the toughest of challenges and according to Olympian NSW Sales Representative, Ken Fackler, Thiess’ predicament called for some re-engineering miracles. 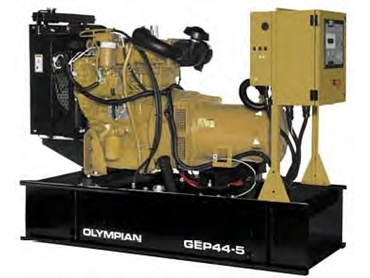 After running the Caterpillar Generator SpecSize software programme, Ken recommended a 44.5 kVA Olympian GEP 44.5 generator set. “Once the Olympian GEP 44.5 was agreed upon we set about re-engineering the standard configured unit in order to fit it into the available space. “The modifications undertaken were extensive, including moving all the integrated electronic controls to the end of the body and incorporating a roller shutter into the sound attenuated enclosure for access. According to Bruce Robinson, a Thiess Electrical Engineer involved the later stages of the project, the technical support received from Ken and his team at Energy Power Systems Australia to sort out the problems was excellent. “Once we figured out what the load was going to be the Olympian option was a pretty convenient one for us, as they are already involved on-the-ground here supporting their other equipment. “The service vehicle has been operational for nearly 12 months now without any problems”, Bruce said. Available for use with diesel fuel, propane, or natural gas, Olympian generator sets deliver dependable, clean economical power even in the most demanding conditions.